Mutton Khichda, an all-in-one cuisine, is a combination of lentils, broken wheat, rice and meat. Khichda, nowhere related to Khichdi, is my another favourite, after biryani. Khichda is more famous among Muslims of South Asia. It is served in the main course. Khichda is specially cooked in the month of Ramadan and Muharram. But this is such a dish that once you taste it, you’ll feel like having any time. 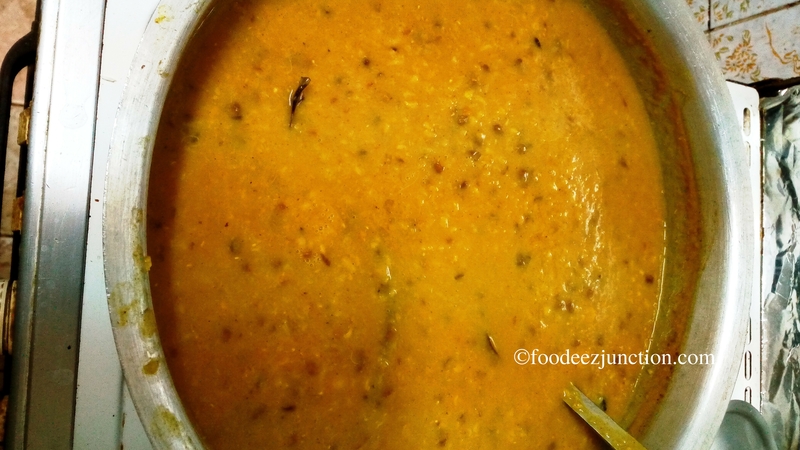 Khichda has another variation – Haleem. 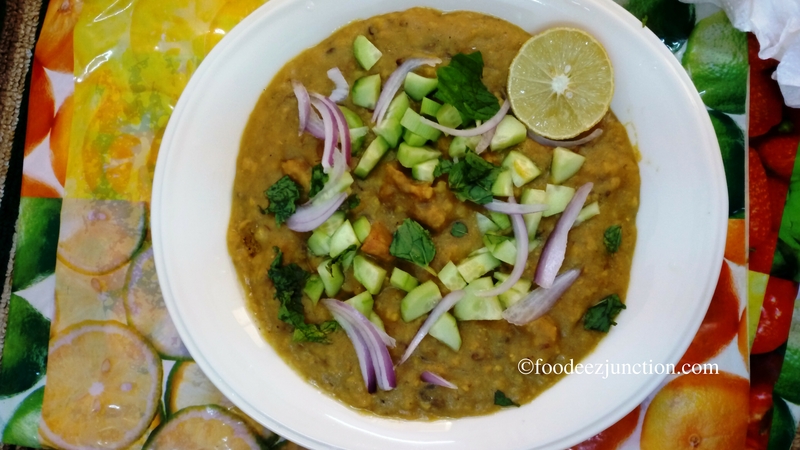 Well, Haleem has almost the same ingredients but the cooking method is different. If you don’t like mutton, you can cook Chicken Khichda too. 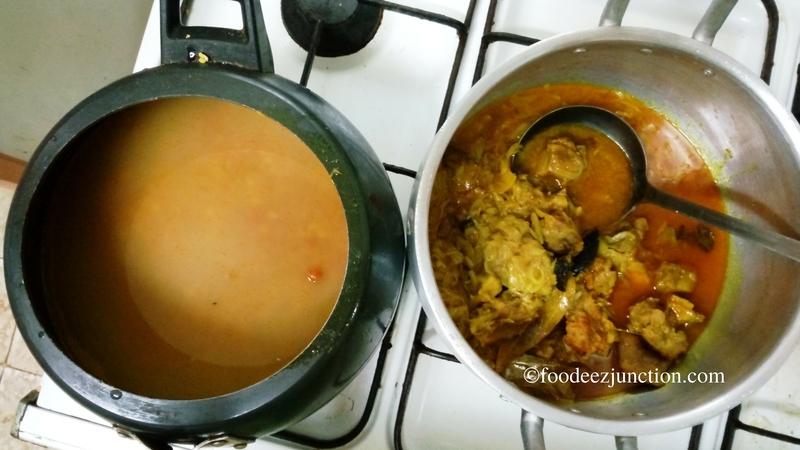 Only difference will be the cooking time will decrease as chicken cooks quicker than mutton. A secret 😉 — if you store khichda for a day in refrigerator, it tastes more yum. Or you can cook more and save some for the next day. This is an amazing non-vegetarian dish. In khichda, garnishing also plays a significant part to enhance the taste. So follow this step by step recipe to make Khichda and share with me at foodeezjunction@gmail.com your cooking experience. Here we go, with our Khichda recipe. Soak the broken wheat and barley in adequate amount of water for 2 hours. Take another bowl, and wash and soak all the lentils together for 2 hours. In a pressure cooker, take the washed mutton. Add oil (no need to heat the oil), roughly sliced onions, cumin, ginger garlic paste, coriander powder, 1 tbspn turmeric powder, all-spice powder, salt and red chilli powder altogether. Add very less amount of water. Cook for half an hour or at least 10-12 whistles of the pressure cooker. Cook till the mutton becomes soft and eatable. Now transfer the cooked mutton in a big cooking pot. Keep it aside. In the same pressure cooker add all soaked lentils, rice, salt, 1 tbspn turmeric powder, green chillies and two glasses of water. Cook for half an hour or for 10-15 whistles of the pressure cooker. After that put off the flame and wait for 10 minutes. 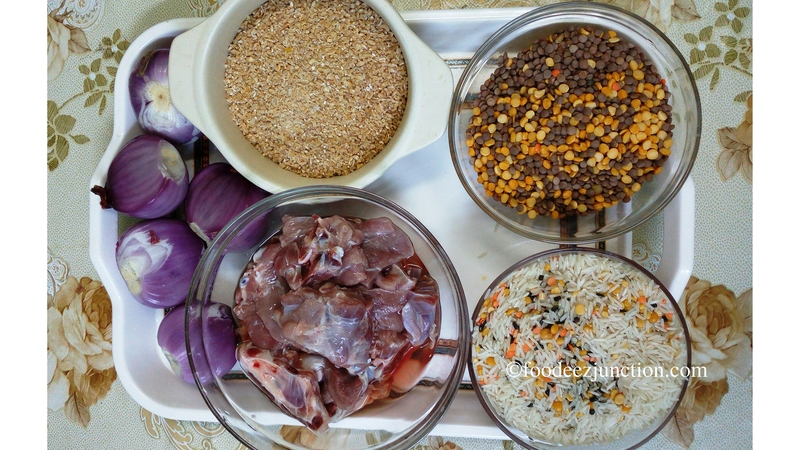 Now, transfer the cooked dal and rice mixture to the same cooking pot where we’d put mutton. Put it on heat. Mix well. Add five glasses of water and again mix. Here you can check the salt and chilli. If needed, add more. Cook further for 1 hour on medium to low flame. Stir at every five minutes. Cook till it becomes thick as shown in the pic. Khichda is read! Put off the flame and cover the pot with a lid. In a medium-sized frying pan, heat 4-5 tbspn of pure ghee. Add finely sliced onions and fry till golden brown. Add this to the cooked khichda. Serve the hot and super yummy khichda. I would recommend to directly take it out in the plates. Garnish each plate of Khichda with mint leaves, finely sliced raw onions, 1 tsp lemon juice, green chillies, finely chopped cucumber and radish. Tip: Don’t leave the dish on flame untouched otherwise it will stick at the bottom of the cooking pot. Adjust salt and chilli according to your taste as some people like khichda super hot and spicy. Hey Tabassum.. Thank you. I’m glad you liked it 🙂 Khichda is one of my favorites too!